A group of leading opposition candidates recently stated that they are “convinced that honest, free, transparent and democratic elections cannot be obtained under the presidency,” citing “reprisals and repression by police against peaceful demonstrators” that left two candidates injured. The United States isn’t too worried about the state of affairs. In fact, it’s invested nearly $30 million dollars in the elections. After all, this isn’t Venezuela; it’s Haiti. Contrary to the distorted portrayals of Venezuela repeatedly put forth by the media, think tanks, and the US government, the country’s electoral processes couldn’t be more different than Haiti’s. In Haiti’s October 25 presidential primary, over 70 percent of registered voters abstained, just as they did in 2010 for the flawed elections that brought Michel Martelly to power. Venezuela’s elections routinely produce the opposite result: 79.7 percent of the electorate voted in the 2013 presidential contest, and even its subsequent municipal elections boasted a 58.9 percent participation rate. Polls regarding today’s legislative elections indicate an expected voter turnout of above 70 percent, suggesting that the Venezuelan electorate appears stubbornly unaffected by the “campaigns of fear, violence, and intimidation” that State Department spokesperson John Kirby alleges are occurring. Jimmy Carter has thus asserted that “of the ninety-two elections that we’ve monitored, I would say that the election process in Venezuela is the best in the world.” Additionally, Venezuela’s political parties jointly audit 54 percent of all paper-receipt ballot boxes immediately after the elections, giving the vote count “a very high possibility of being honest,” in McCoy’s words. How high a possibility? The statistical chance of the Venezuelan opposition’s claim that the 2013 election was stolen was 1 in 25,000,000,000,000,000. The United States took a gamble against those odds when the State Department joined with the opposition to demand a full recount. The Obama administration became the only government in the Western hemisphere that refused to accept the results, backed only by the right-wing government of Spain and the secretary general of the OAS, 60 percent of whose annual operating budget is financed by Washington. Like many similar US institutions preoccupied with Venezuela, theWashington Post, the International Crisis Group, and Brookings have published no commentaries and have held no events to probe Haiti’s election problems, such as the more than nine hundred thousand accreditation cards that were circulated and sold in “a thriving black market for fraud,” according to the Miami Herald. These cards made it easy for the possessor to vote multiple times, and such ballots represented over half of the votes registered. The State Department’s Haiti Special Coordinator Kenneth Merten appeared disinterested, simply stating, “We look forward to the second round of presidential elections.” The reason for the State Department’s selective demands for recounts is simple: Haiti is safely under US control, while Venezuela is not. Despite their differences, Venezuela and Haiti have been linked together over the past fifteen years as the two principal targets of US intervention in the Western hemisphere. Indeed, the remarkably durable success of the US overthrow of Jean-Bertrand Aristide in 2004 owed greatly to, and built on, the strategies honed during the failed attempt to topple the elected government of Hugo Chávez in 2002. Foreshadowing its approach in Haiti, the Bush administration, according to a State Department report, trained and financed“individuals and organizations understood to be actively involved” in the overthrow of Chávez, through entities such as the National Endowment for Democracy, the US Agency for International Development, and the International Republican Institute. The US withheld prior knowledge of the coup plot from the elected government, while advancing grossly exaggerated reports of alleged government misconduct. And finally, the Bush administration immediately recognized the illegitimate coup government while falsely claiming that Chávez had resigned. In Haiti, the US similarly provided financing for Haiti’s recalcitrant political opposition to make the country ungovernable and cut offinternational aid essential to public health and education. US-trainedparamilitary groups terrorized the country before the Bush administration delivered a final coup de grâce, spiriting Aristide and his family out of the country on a US plane. And like Chávez, Aristide would remain incommunicado after his “resignation” was declared. This time, however, the US ensured that he would be held an ocean away in the Central African Republic. 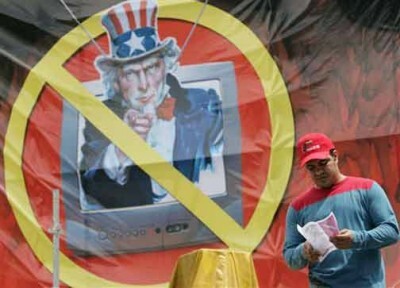 Most critically, after having faced a Western hemisphere united in its repudiation of Venezuela’s coup government in 2002, the United States pushed through a UN resolution just days after the coup that created an armed occupation of the country with much of Latin America participating, as well. By providing protection to the still-fragile US-installed regime of Gérard Latortue, the UN occupation also permitted the use of unmitigated force to quell dissent, particularly in poor, pro-Aristide neighborhoods. Port-au-Prince registered roughly two thousand political murders a year, which was met largely with silenceby leading US human rights groups. After being frustrated by the overwhelming mobilization of Chávez’s supporters, who flooded Caracas and overturned the coup regime, the United States learned its lesson in Haiti. For these reasons, Venezuela — which the Obama administration still officially designates an “unusual and extraordinary threat to the national security” and which recently learned of widespread National Security Agency espionage of its state-owned oil company in 2011 — has balked at the US’s insistence that the OAS observation its elections. OAS Secretary General Luis Almagro, who served as Uruguay’s foreign minister, behaved so undiplomatically in his calls for an OAS presence in Venezuela that his former boss, Uruguayan ex-president José “Pepe” Mujica, publicly disowned him. The concerted campaign to discredit Venezuela’s elections consists of US media, NGOs, and public officials proclaiming virtually identical concerns about democracy while ignoring or actively promoting exactly the anti-democratic tendencies that they profess to deplore in a country firmly within their sphere of influence. Latin America rightly sees this dishonest discourse emanating from Washington as a component in an effort to advance a deeply unpopular agenda for the region. Latin America’s long-held resentment toward the imposition of that agenda has led to increasing rejection of a US-run multilateralism that furthers US intervention. To that end, these countries have developed a range of alternatives over the past decade: the Community of Latin American and Caribbean States, the Bank of the South, ALBA, and the Union of South American Nations (UNASUR). The presence of the electoral delegation of UNASUR in Venezuela, led by the Dominican Republic’s former president, Leonel Fernandez, is therefore a sign of progress. Largely fulfilling the vision with which it was created in 2008, UNASUR, which excludes the United States and Canada, has rapidly displaced the OAS as the region’s preferred institution for resolving conflicts and managing multilateral affairs.